In most countries, website (and IT systems) owners are legally obliged to advise the users if a log is kept of any of the users’ data (such as emails and blog posts) or actions. Regulatory compliance requirements such as GDRP and PCI DSS also typically require website administrators to alert their users of an audit log. The above is the default message that is used once the option is enabled. 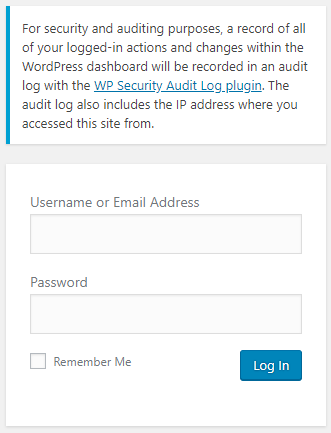 Should you wish to change the WordPress login page notification you can easily do so by following the instructions in this post. 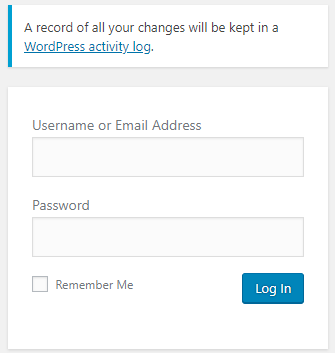 How to Change the WordPress Login Page Notification? To disable the WordPress login page notification you might have configured simple untick the checkbox of the Login Page Notification setting, as per the below screenshot.